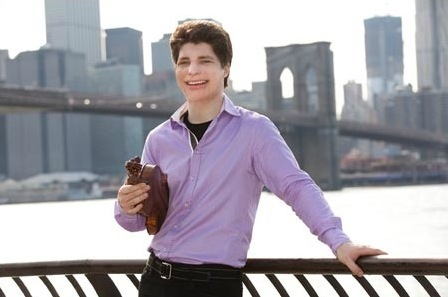 January 13, 2014, 11:04 AM · Violinist Augustin Hadelich seems to show even deeper artistry and more enjoyment in performing, every time I hear him play live. Hadelich played the Beethoven Violin Concerto in three concerts last weekend with the Los Angeles Philharmonic at Walt Disney Concert Hall -- I attended the Saturday evening concert. He and conductor Edo de Waart were called in as last-minute substitutes for violinist Christian Tetzlaff and conductor Christoph Eschenbach, who canceled due to illness. Tetzlaff was to have performed the Schoenberg Violin concerto. (Tetzlaff also canceled his performance of the Mendelssohn with Naples (Florida) Philharmonic, for which violinist Chad Hoopes substituted.) I'd still like to see Christian Tetzlaff play; wishing him good health! Indeed, the Schoenberg Violin Concerto would have taken us on a completely different journey -- one less-traveled and more troubled than the sunny Beethoven. As it was, Hadelich's Beethoven was riveting and beautiful. The opening was so perfectly in tune, it made me want to cry. What is so soul-penetrating about pure intonation? I don't know. Later, my husband Robert observed, "You know how people always quote (the late Juilliard violin professor) Dorothy DeLay as saying, 'Honey, what is your concept of F#?' Well, it's THAT, for every single note, THAT!" But intonation wasn't the only thing that was so perfectly right about the performance; it was also the fact that Hadelich embodied the music, whether he happened to be playing at the time or waiting during an orchestral interlude. His presence and immersion in the music kept it in the here and now -- the essence of live performance, that we don't dial back into the recording in our heads during a piece as familiar as the Beethoven concerto. General fidgeting in the audience stopped, even for the guy down the row from me who was quietly clunking his feet all through the opening "Egmont Overture." The spellbound audience is as much a part of such a performance as the performers. Hadelich played the Kreisler cadenza with beautiful timing, flawlessly executed. After the first movement came applause -- for a very long time. He smiled, nodded graciously, and moved on, with the high filigree of the second movement, a high-wire walk that nonetheless sounded completely carefree. Then came the joyous last movement, so in tune, in time and well-articulated. No words for the beauty and brilliance of the cadenza, which he played with complete mastery. Afterwards came a fairly unanimous standing ovation and four curtain calls, after which Hadelich tossed off the totally easy Paganini Caprice No. 9 as an encore. Easy for him! Somehow he is able to find that balance between strong articulation and expressivity, with all those octaves, ricochets, and leaping high and low. His playing shows a tenderness, right in the midst some of the most wickedly difficult music ever written for violin. The audience rose to its feet immediately. Without the Schoenberg Concerto, the rest of the program seemed almost like a classical pops concert, with the second half featuring Dvorak's New World Symphony. Now this is a familiar piece, even more so than the Beethoven. My husband started tapping his toes during the last movement, which he remembered from his childhood viola days, during which he'd played this movement in youth orchestra. In fact, I had images from junior high dancing in my mind as well. I suspect every musician in the LA Phil had played this symphony by the age of 16. Old hat, eh? But this is still a greatly satisfying piece, especially that last movement, where Dvorak puts everyone in the entire orchestra to work on some unnecessarily complicated inner voice. Yet all that busy-ness and tremolo is what gives it so much energy. The end is a heck of an apotheosis, the gorgeous dissonance of two themes epically colliding, then a march to the end. If you'd like to read more about Augustin and the Beethoven Concerto, here is an interview we did several years back, in which he spoke about the Beethoven; and a review of a 2012 concert with the Los Angeles Chamber Orchestra, in which he also played the Beethoven. And here is our original interview with Augustin. Here is Augustin playing Paganini 24 -- not the same Paganini caprice as in the concert, but enjoy!